Please watch this video. Please. MSNBC Political Analyst Rachel Maddow makes a compelling case that GOP frontrunner Herman Cain is pulling our leg. 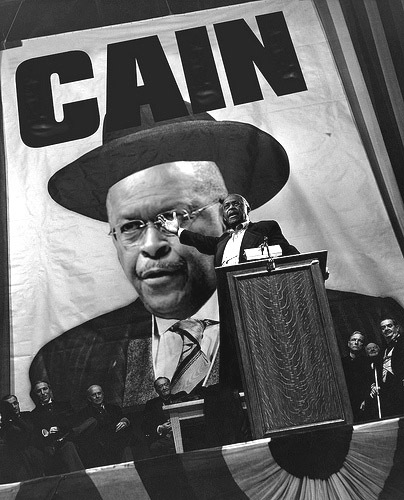 At most every point of Cain's quixotic candidacy he has left clues, dropped breadcrumbs, indicating, clearly, that his is a political send-up, a satirical candidacy. From quoting Pokémon (not making this up) to modeling his "999" tax plan on the tax pan from the video game Simm City, to his embrace, last week, of the rather infamous Koch Brothers, to even the alleged scandal over sexual harassment, breaking into song when asked about it--if you step away and put all of these pieces together, it becomes amazingly clear: Cain is having fun at our--and America's--expense. He is selling books and raising his speaking fees through the roof. He may actually be doing a lot more. The one thing he is not doing, however, is running for president. There are white people laughing in most every photo I see of Cain, Cain just cracks white folks up with his jaunty, down-home banter, his indecipherable stand on most issues important to the right wing, his active disengagement from facts, figures or world leaders (“ubeckie-beckie-beckiestan’). Cain puts on such a good show, in fact, that it now verges on competing with Comedy Central's deadpan send-up of conservative politics, The Colbert Report. 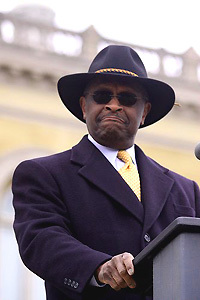 For me, the rise of Herman Cain is a head-shaking confirmation of what is seriously wrong with America. I’ve repeatedly condemned the vast majority of the voting public as being woefully uniformed and easily bamboozled; drones of whatever is on the tee-vee. Whether a befuddled doofus or evil genius, Cain knows how to work this process to his best advantage. He trumpets his disengagement with the issues and makes that benign ignorance a hallmark of his campaign. Most any person of even reasonable intelligence knows the GOP have fielded a group of lightweights and extremists led by the I’ll-Do-Or-Say-Anything-No-Really-Anything-To-Win stiff Mitt Romney and followed closely by a handful of clowns. It’s all clown school over there, with Cain as their lead minstrel. No serious GOP heavyweight wants in for 2012 and maybe for several good reasons: (1) Obama will be harder to beat than conventional wisdom suggests, (2) the country will be in such an impossible mess by the time they take office, who'd actually want the job? For most rational Republicans, 2016 is a much better opportunity. Unless some miracle lands the ingenuous and robotic Romney in the Oval office, 2016 will be wide open for the GOP with no risk of being trounced by the still enormously popular Obama. That we’re even discussing Michel Bachmann is a clear indicator of how weak the field is, when there is really no shortage of credible, weighty GOP heavyweights who simply refuse to get in. Despite all their rhetoric, they know the 2012 race is a huge political risk. While not enjoying anything at all like the human tsunami of support he had in 2008, the president will still command the groundswell of voters to whom the GOP and their clown school candidates are an abhorrent and unthinkable choice. Mitt Romney has absolutely no chance of convincing the vast majority of voters under 30 to support him. This is a demographic the president has locked. His main challenge is to convince them to actually put the bong down and go to the polls. The Greatest Show On Earth:: Cain a la Kane. Cain, meanwhile, is a huge Republican asset. He helps diffuse legitimate claims of racism against the party and their whack-job fringe, while comforting White Fear by being a clown. That’s what Mr. Cain is: a clown. These white folks, laughing in every picture, are not laughing with Mr. Cain, they are laughing at him. At the clown in the ridiculous Stetson. Histrionic, an apparent snap temper, at times inarticulate, uninformed, folksy, get-along. Fred Sanford with a million bucks in his checking account. This is what White America is comfortable with: a black man they don’t have to take seriously. We don’t have to take Herman Cain seriously because Herman Cain does not take Herman Cain seriously. This is not a serious person. There is still palatable doubt Cain is actually ruining for president. It’s all a hustle to sell books. How long does he think he can outrun this mess with the sexual harassment complaints? I can’t stand it, cannot, when these well-heeled blacks suddenly become blacker when their dirty laundry is publicly aired. I hated it when Clarence Thomas did it, hated it when O.J. did it, when Michael Jackson did it, and now we have this guy—this embarrassment to the race—stonewalling against documents he refuses to release. Claims of racial bias rooted firmly in self-interest only makes the cause of fighting *actual* racism that much harder. This is why nobody takes claims of racism seriously, because the race card is too often exploited, first and foremost, by prominent blacks trying to weasel out of something. The unmitigated, sheer gall of the GOP claiming Democrats are using racism against Cain--in this, the season where the Tea Party is barely decipherable from the KKK, is simply stunning. Herman Cain is a liar, period. And a clown. and a woeful drag on the progress of African America. He’s giving White America what they so desperately needed: a free pass on three years of raw, unbridled racism leveled at this president. White America equates Herman Cain with Barack Obama, figuring it’s a wash. This is a lot like comparing Al Bundy to Steve Jobs. The petulant, ridiculous minstrel Herman Cain is by no stretch of the imagination Barack Obama’s equal. I imagine Obama advisors must be on their knees, day and night, praying Cain gets nominated, if for o other reason than to make that point in spades. Unless Otherwise Specified, Text Copyright © 2011 Lamercie Park. All Rights Reserved. Herman Cain grew up in Atlanta, Georgia with loving parents and little else. His father worked three jobs—as a janitor, a barber and a chauffeur—and his mother was a domestic worker. Even though these jobs required hard work and little glamour, his parents knew this life was better than the dirt farms upon which they grew up. They also knew that this hard work was the key to achieving their American Dreams. Inspired by the work ethic and character of his parents, Herman continued his education by earning his Master’s degree in computer science from Purdue University while working full-time developing fire control systems for ships and fighter planes for the Department of the Navy. Though Herman enjoyed using his talents as a civilian employee for the Navy, he gravitated towards the culture of business. Herman returned to his home of Atlanta to begin working as a computer systems analyst for the Coca-Cola Company. After considerable success at Coca-Cola, he moved to the Pillsbury Company. Within a short period of time, Herman rose to position of Vice President. Although the comforts of a corner office on the 31st floor of a majestic corporate building seemed satisfying, Herman knew that he needed a challenge. He became the regional vice president of Pillsbury’s Burger King division. This meant starting from the “ground up,” dodging grease fires and broiling hamburgers. Herman was assigned to lead a low performing region of 450 of their restaurants. Within three years, it became the best performing region in the company. Energized by overcoming the many obstacles of his job at Burger King, Herman took on the biggest challenge of his career. He accepted the call to become the President and CEO of Godfather’s Pizza, a company that was teetering on the edge of bankruptcy. In just 14 months, Herman returned Godfather’s to profitability and he led his management team to a buyout of the company. His professional successes garnered the respect and admiration of industry peers who named him the President of the National Restaurant Association. Under Herman’s administration, the group grew significantly and began to lobby for the interests of America’s restaurateurs and small business owners. In 1994, as head of the National Restaurant Association, he had the opportunity to speak with President Clinton during a nationally televised town hall meeting. Here, Herman challenged the President regarding the impact on businesses if his health care overhaul proposal were passed. President Clinton attempted to assure him and the millions of viewers watching at home that his legislation would not harm American business owners and their employees. Herman was skeptical. “Quite honestly Mr. President, your calculations are incorrect,” he said. “In the competitive marketplace, it simply doesn’t work that way.” His words echoed across America, and Newsweek named Herman Cain the primary saboteur of Hillarycare. Through these and other appearances on behalf of the National Restaurant Association, Herman began working with business leaders across all sectors of the American economy. This led to his acceptance of a position on the Board of Directors of the Federal Reserve Bank of Kansas City, and he was subsequently elected their chairman. In this role, he analyzed economic conditions in the region and notified the Federal Reserve of how their policies should respond. Most recently, he hosted a radio talk show, “The Herman Cain Show,” on Atlanta’s WSB 750 AM/ 95.5 FM. He serves as a regular contributor on several broadcast networks and as a keynote speaker at conferences and events around the nation. Despite the many professional commitments of his life, Herman continues to enjoy most the time spent with family and friends. As his children got married and had their own children, he knew that he had an extraordinary obligation to do what he could to make this a safe and prosperous nation for them. The paramount joys in his life are his wife, Gloria, his children and his grandchildren.